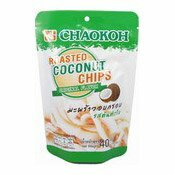 Chaokoh Roasted Coconut Chips, produce from the best selected raw materials, follows international standard production process and quality control to produce this flavourful healthy snacks that everyone can enjoy it for a healthy lifestyle. East directly as snack with beverages. Use as an ingredient for bakery products. Keep package tightly close upon opening. Ingredients: Coconut Meat (92%), Sugar, Salt.